I’ve only touched on black metal here once before, and that was a rather curious and unique example of the genre. Diabolical Masquerade are not at the forefront of most minds when naming bands that fit the bill for the genre–more likely, you will hear Immortal, Mayhem, Burzum, Darkthrone–and Emperor. I picked this album up from the sadly defunct store Musik Hut in Fayetteville, source of not only much of my metal from years past (on vinyl or otherwise) but also of my “black X” collection, and even a few other oddities indicative of how odd that store actually was. It was intended as a metal/punk/industrial store, but did carry plenty of other and “normal” stuff. As with much of metal (other than Morbid Angel and Decapitated, and a handful of others)–such as At the Gates–even the classics (like Emperor here) were introduced to me by a single soul, to whom I tend to give credit for most of my metal awareness. He and I still talk metal now and then, of course, but also the odd other chunk of music, since neither of us is married to it in exclusivity. When I bought this record, I don’t recall what else it was I was considering purchasing with my then-limited funds, but I recall Bob, owner of Musik Hut coming outside to inform me during deliberations that this was more likely to disappear and was, thus, the better choice at the moment. It was also a part of my occasional (weird) habit of completing my collection of an artist or band’s discography via part vinyl, part CD approach. 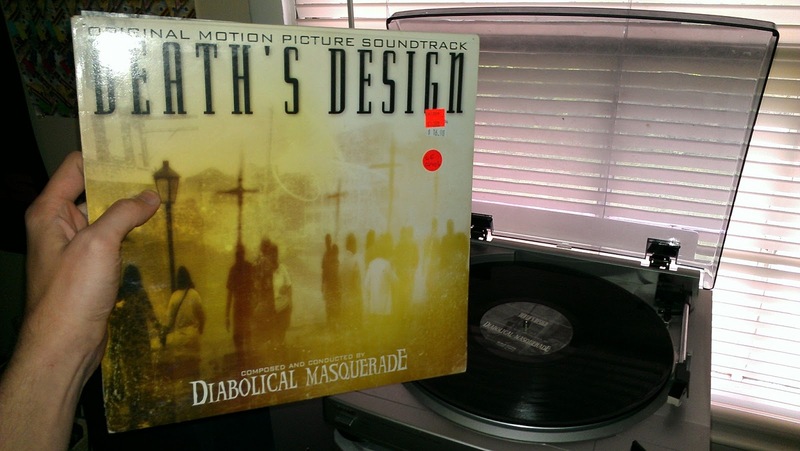 I still have (after a few sales and purchases for expanded and fancier editions) Anthems to the Welkin at Dusk, IX Equilibrium, and In the Nightside Eclipse on CD, and still don’t have any on vinyl, nor this album on CD. It does mean that, for reasons of time and convenience, this is the album I have listened to the least–there is no song I know immediately like “The Loss and Curse of Reverence”, “An Elegy of Icaros”, or “Into the Infinity of Thoughts”. It helps nothing that Emperial Live Ceremony was recorded and released before the album, so no songs got doubled exposure, either. It’s making this a peculiar and semi-difficult review: I have never had strong feelings about the album, nor have I had the chance to develop them. Beyond that, black metal is an extraordinarily acquired taste, or so I’m told–many have commented on the breadth of my peculiar tastes, so apparently I’m not overly qualified to comment on that aspect. Indeed, I was perfectly pleased with the first black metal I remember hearing. I’ve known many metal fans, though, who do find it impenetrable. And it’s understandable, I guess, depending on where you come at it from–earlier Emperor (e.g. Wrath of the Tyrant) would give me a headache if listened to in headphones, but that was less a result of the music and more a result of its awful production. Curiously, bad production has occasionally been a deliberate choice as well as a budgetary inevitability. 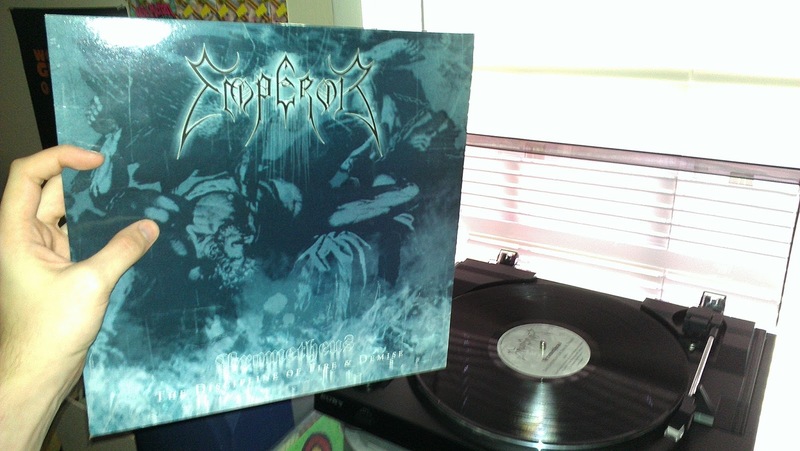 Emperor’s records from In the Nightside Eclipse on to this one (their final studio album) are nothing like that. 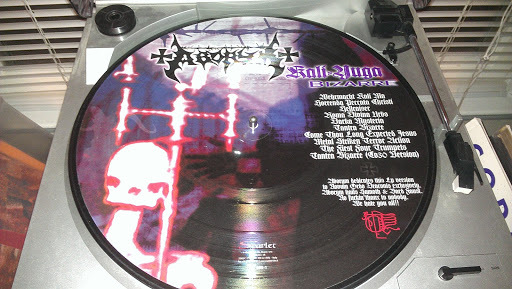 The production tends to be quite clean for the material (it’s still metal, so it is still quite heavy on distortion), which can also be attributed to the “sub-sub-subgenre” of “symphonic black metal”, which Ihsahn slowly pushed their sound toward as time went on–or rapidly, I suppose, if one listens to Anthems to the Welkin at Dusk and specifically tracks like “Al Svartr (The Oath)” or “The Wanderer”. “The Eruption” opens the album in a fashion not dissimilar to those tracks on previous albums, with howling winds, a whispering setting of the scene from Ihsahn (“…And after years in dark tunnels, he came to silence. There was nothing…”), and then a harpsichord (almost guaranteed synthetic) and synthesized violin set a kind of mixed quaint, gothic, and isolated tone before his guitars come in with Samoth’s to fill the sound out enormously on top of Trym’s drumming, their melody repeating that of the harpsichord’s. And then the sound turns to that of black metal: sheets of rapid guitar riffing and Trym’s signature fill-heavy and descending drums. The track makes immediately clear that this album is not going to be straightforward. Ihsahn’s growing fascination with clean vocals overlaid, as started on their previous album (IX Equilibrium) is now put to full effect–there are echoing choral voices (all his, of course!) that answer his “shrieked”¹ verses, and a rather melodic (and actually catchy!) chorus. The tempo and sound is fluid; little remains consistent throughout it, though it comes back to its own sounds repeatedly, shifting as if a set of constantly rising and lowering terrain that has an underlying but non-simple pattern to it. Continuing the “spoken introductions”, “Depraved” further sets forth the “concept album” behind it all, though it makes it no more explicit. The music that follows the introduction is call-and-response shards of high-end guitar met with thundering force of drums, bass, and fuller-sounding guitars. It actually fairly well chugs for quite some time, until it locks into a melodic riff and a machine-like set of rapid drumming from Trym. A more consistent-sounding song, its only movements tend to shift the sound of that riff, or act in normal bridge fashions, linking similar passages. The closest the album came to a single, “Empty” did have a promotional video made for it. In true Emperor fashion–hearkening back to their classic first two albums–the song simply starts. Like many of their most famous tracks, there is only an introduction of a kind–Trym does not work his way into the clattering wall of beats that the song possesses, it simply starts from the outset. Repetitions of “He is an empty shell” anchor the song next to the atonal pinched harmonic noise of its clearest lick, while short passages of keyboards give way to a more straightforward riffing movement in a more familiar tempo–curiously, the verses, not the chorus. “The Prophets” is another doom-y moment for the album, much like portions of “Depraved”, as it chugs forward at a steady 4/4, deep vocals mixed heavily with the guitars gutturally swarm across the track, which makes the lower-mixed-than-previous clean vocals both more apparent and more naturally blended when they answer. It’s those clean vocals that bridge the song into its halfway point, wherein the guitars are heard in isolation and suddenly speed up to a new riff, that Trym slips in under with a constant blastbeat (snare-bass-snare-bass) that is so intrinsic to much of the basic black metal sound. The thinned, high-end lead lick that is used to contrast with the rapid riffing it trades off with is also a signature sound: it is cracked and fragile, but only at a glance–it’s actually confident and empowered in a fascinating way. In “The Tongue of Fire”, we’re again treated to the relative absence of introduction, but, as the longest track on the record, it has perhaps the most variance in sound of all, turning entirely from its heavy and charging first section to a slowed and expansive, synth-heavy middle section dominated entirely by Ihsahn’s clean voice. When he finally rises off into the distance with the phrase, “Slowly maddened/By the emptiness…” the sheets of crackling, blackened high-end guitar rain down over Trym’s tom-pounding and oddly hopeful and semi-positive synths. Guitars that reclaim the track are indicative of the melody riffed earlier, but instead cleaner and more lead-oriented, taking the instrumental portion of the song off into a complete third direction that suddenly turns into a curling, sharpened fourth portion that re-introduces the heavy sound via bass and drums, as well as Ihsahn’s voice, but declines to return to riff-styled guitars. It does also drop in that one falsetto-esque King Diamond-styled moment, which introduces yet more unique passages in the song, which declines to end cleanly, but instead to fade slowly on the imperial synths and cracked guitar leads of the central few moments. “In the Wordless Chamber” is blastbeats and gothic synths over those speaker-filling sheets of guitar that are the absolute signature of black metal. Synthesized horns add a curious sound to the track, over Trym’s relentless beat, they almost imply a kind of charging mounted army, sending out the call to attack. For a title like “In the Wordless Chamber”, it seems odd and incorrect, but it comes to a halt and folds back on itself with a gong–the quietest moment in all the album, or at least the most serene, follows: it’s all synthetic strings and more generalized keyboard-style waves beneath that. But somewhere in them, a noticeably flat note begins to herald the return of that forward charge of horns and thundering drums. “Grey” is a return to the distinctly complicated sounds of previous tracks that were uninterested in find a sound and sticking to it–not in the sense of the immediately previous pair, but those like “Depraved”, though it, too, has a quieter section–but one dominated by the cascades of blackened guitar, rather than the sorrowful synthetic strings that weave around behind. The nature of black metal makes it all feel like a kind of climax to the album’s concept and story, but it isn’t–if that feeling defined that moment, the entire album would be climax with only brief reprieve. It is, however, a clearly increased slope upward toward that moment. “He Who Sought Fire” stomps heavily, but a single guitar seems to be trying to draw it back into the crashing maelstrom of more familiar black metal territory, which it is indeed successful at after mere moments; Trym is led to frantic blastbeats and then exhaustingly inescapable double-kick bass drums. Ihsahn has fully wrested the band from any grip of “standard” black metal, though, with a lead guitar that soars over the track and defies the dirtied, thinned and wall-wide sound more typical of it. Somewhat surprisingly, a bit of “wah-wah” is actually run over his guitar sound, though more for a consistent modulation of a repeated riff than anything else. Perhaps one of the most-liked tracks on the album (at least, in my experience, which is admittedly confused), “Thorns on My Grave” is indeed a final track, but not an outro. A momentary hook is built around fingers slid rapidly up the neck of guitars, a sound that is unusual for the record and yet entirely interesting. The synths, in full “symphonic” mode, act as backing to the riffs and fill the track with drama in lead up to the pounding of the verse, which is punctuated by the repetition of that slid-finger lead. The wild spirals of high-end strings lend a chaotic, climactic note to the verses, surrounding that chorus: “For it holds every disease/Ever exposed/It holds all pain and death/It could ever unleash…” he howls wordlessly after its final repetition, and introduces the last verse, howling out the last words with unheard passion: “I am the father/I am the son/My refugee soul has escaped/This body depraved/Of final wishes I ask none/But one/Now that I am gone/Lay thorns on my grave!” and the album ends suddenly on the most emotionally extreme of notes it experiences. Prometheus still tends to remind me of Death’s The Sound of Perseverance, in that it is a clear continuation of a band’s sound, but now almost totally divorced from its simplistic origin and wrapped in a bombastic, progressive, focused, clean, clear package. It’s not an album that you would expect, nor one that you wouldn’t. Death’s Symbolic clearly paved the way for their final album, much as there’s a clear movement toward Prometheus for Emperor, but in neither case would that final work be the expected end result–so far as I’m concerned, anyway. Depending on your existing taste, Prometheus may actually be the first Emperor album you want to look at–if musical reaching, complexity and craft are your bread and butter, there is no better example. Those moments are spread, scattered, or at least separate on even albums like the one immediately before this. But his one is uniquely focused–Anthems has its columns that string the parts together, but Prometheus flows between its parts without need of guideposts to remind you it is a single journey. ¹This is the term I’ve always used for black metal vocals, to contrast them with the much lower-pitched sound of death metal vocals, but it’s imperfect. Ihsahn’s often sound (in later years at least–in the earlier ones, he tended to sound more like he was hissing them through a laterally pinched voice) more as though he is making sound through constant inhalation, rather than exhalation. It means they are a bit too low in pitch to fit that “shrieking” bill, but they are still much higher than death metal “growls”.